Paragraph styles are the cornerstones of our layouts. Professional layout is often identified by its consistency, which is exactly what styles offer us. Nonetheless, I get pushback about taking the “time and trouble” to make styles. I sometimes hear statements like, “we don’t have a lot of text, just captions under photos” or “it’s a pretty simple doc, just headers and body copy.” So I’ll ask how many captions or headers there are or, more pointedly, what happens when a change of font or size is requested. When I say that such a change shouldn’t take more than maybe 10 seconds, no matter how large the document is, I usually get the listeners’ attention. Create a text frame with some placeholder text (either your own jottings or via Type > Fill with Placeholder Text). I try to have representative paragraphs like a header, subhead, or body copy. Highlight and format a paragraph as you’d like it recorded, choosing the font, size, alignment, etc., from the Control panel or the Character and Paragraph panels. 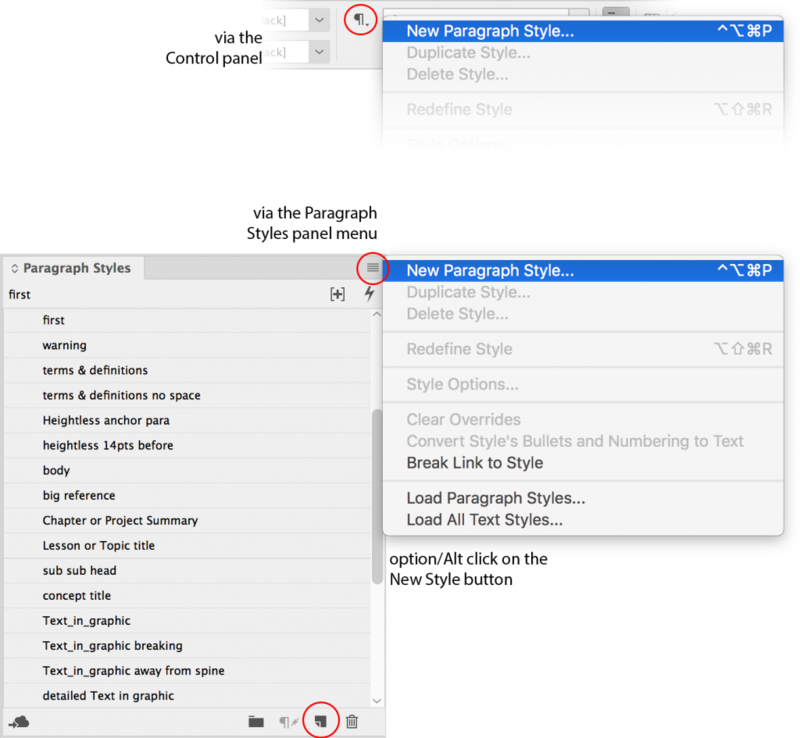 Go to the Paragraph Styles menu in the Control panel and choose New Paragraph Style…. Click the Create Style button in the Properties panel and then type a name. 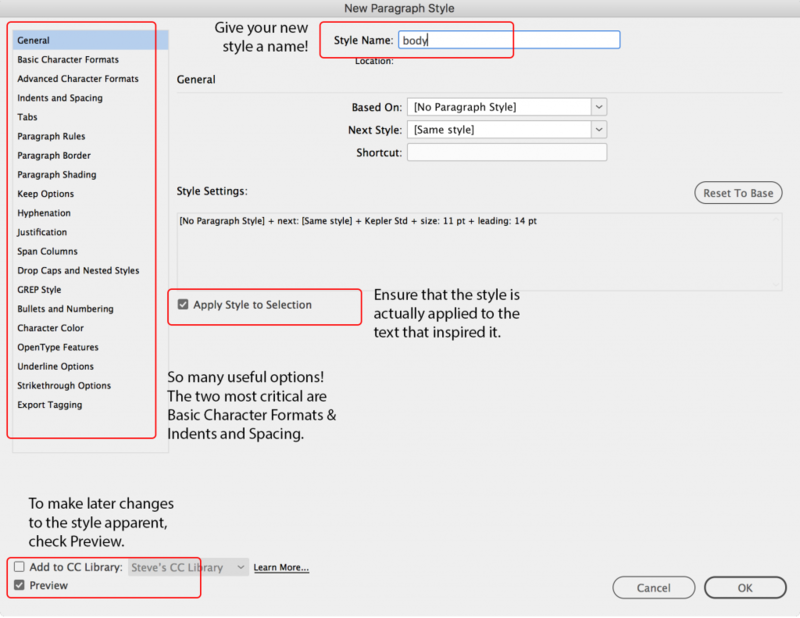 Open the Paragraph Styles panel menu and choose New Paragraph Style…. While holding down option/Alt, click on the New Style button at the bottom of the Paragraph Styles panel. Most of these methods will open the large New Paragraph Style dialog box with a generic name highlighted. Take advantage of the moment to give the style an intuitive name (caption, heading, subhead, etc.). Check the important checkboxes: Apply Style to Selection and Preview. You may wish to opt out of (uncheck) the option to store this style in your Creative Cloud Library unless you know you’ll want to access this style from another computer. Thanks to a kind and empathetic product manager, InDesign will leave those boxes checked from now on. While in this dialog box, you may also wish to make adjustments to the style’s definition via the categories on the left. I describe them in the book, but know that Basic Character Formats and Indents and Spacing are the most important; or are, at least, unavoidable. Clicking OK or pressing Enter will commit your style. Apply the style to any paragraph by positioning your text cursor within it, and then clicking on the name of the style in the Paragraph Styles panel. If you’ve highlighted text that is within several paragraphs, each of those paragraphs, in their entirety, will be formatted with the style when its name is clicked. If a standalone (not threaded) text frame is selected and a style name is clicked, all the paragraphs in it will change (even in overset text). This is handy for items like captions and sidebars. What if nothing is selected when you choose a paragraph style? Then you’ve set that style as a default and it will be used to format the text you create until you choose another default. It will also be the formatting that placed text files will inherit, depending on settings chosen when placing them. To edit the style later I strongly recommend right-clicking its name and choosing Edit “stylename”. And that’s a right-click with no left-click first! Why? Because we apply styles by left-clicking their names and your cursor may not be where you want that style applied. Or worse, you may unintentionally set that style as a default if you have nothing selected. This happens somewhat regularly since nothing on the page will change if a style is chosen with no text highlighted. Only later when new text is made is the default setting discovered. Then we’d have to deselect, choose a wiser default, and choose a different style for the text we made.